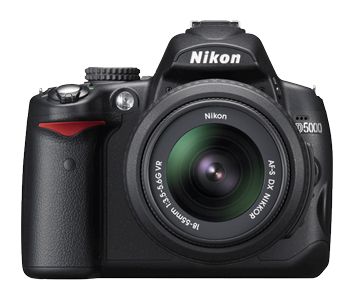 Review: Nikon SLR D 5000 with extended 55-200 mm Nikor lens | Globonomics! I bought this gadget a month ago from BestBuy, California and have been very impressed with it so far. The one I bought also had extended lens of 55-200 mm and it’s therefore now got two focus ranges: 11-55mm and 55-200mm. Scenery shots were simply astounding and I was truly impressed with the performance of the fast shutter speeds and multiple pictures I could click on my recent USA trip with amazing clarity. While I first need to read the primer on how to take manual pictures from my photography affectionado friends, for now, I am getting amazing resolution from my Auto focus as well. 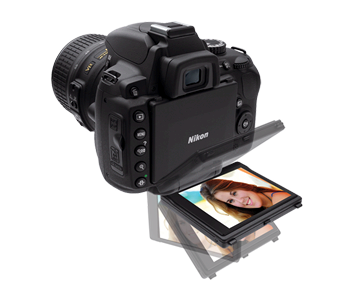 Easy Live View access offers 4 autofocus modes, including Face-priority AF. Creative in-camera image editing, featuring Soft Filter, Straighten, Color Outline Effect, Perspective Control, Red-eye Correction, Image Overlay, Monochrome and more—all without a computer. Versatile and ultra-compact with a powerful focal length range of 55-200mm designed exclusively for Nikon DX format SLRs. Ideal 3.6x zoom lens for portraiture, sports or wildlife photography. New compact rod-type Silent Wave Motor (SWM) enables ultra-high speed auto focusing with exceptional accuracy and super-quiet operation. Two Extra-low Dispersion (ED) glass elements achieve minimized chromatic aberration and superior optical performance. 9-blade rounded diaphragm for more natural out-of-focus highlights. 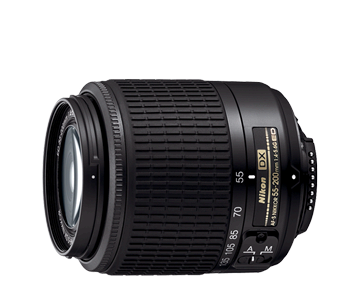 An excellent companion to the AF-S DX Zoom-NIKKOR 18-55mm f/3.5-5.6G ED. Nikon Super Integrated Coating (SIC) minimizes ghosting and flare to provide even higher contrast and more vivid images, even in challenging light conditions. Focus mode switch enables quick switching between A (auto focus) and M (manual focus).